The long-awaited PS3 killer title has finally arrived, but will it bring new life into the PS3, or die like the rest? 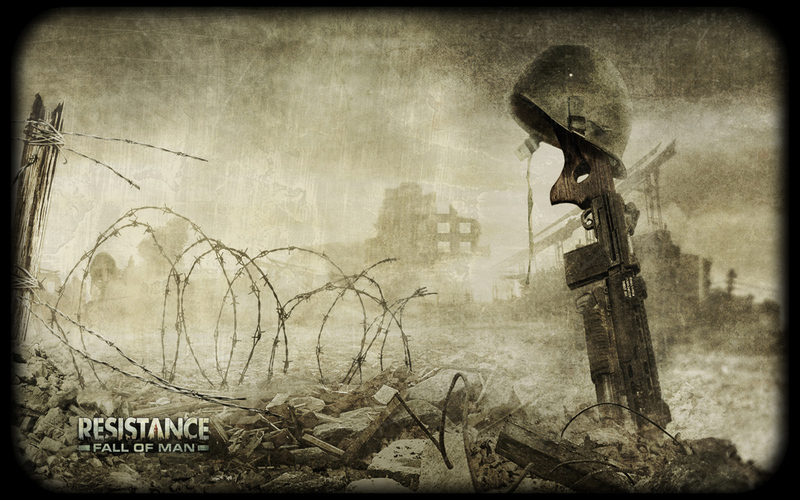 War Drama: The story of FoM is one of the best parts of the game, and is one of the deepest storylines I've ever seen in an FPS. The story focuses on the Chimera -- a species of unknown origin that broadcast a virus that converts other life forms (including humans) into more Chimera. The Chimera have already over run Russia and all of Europe and humanity's hope for survival is slim, and as always, the tide of the battle rests on the shoulders of U.S. Army Ranger, Sgt. Nathan Hale. The story of FoM works tremendously well just in part because of the great atmosphere. The game's battlefields look dark and gloomy, and have the feeling that many have already died at that spot. In addition to that, there are fair shares of cheep scares that hit you while you explore long, dark, winding tunnels and such. The story is told so well that you become fully immersed in the game after only a few minutes. Also, unlike most FPSs, as you traverse through the environments, they are actually different, whereas usually you will find yourself walking down the same corridor over and over for the entire game. Tools Of Death: One of the best aspects about the game is the incredible arsenal that you have at your disposal. As Insomniac (the developers of the game) have already shown with the Ratchet and Clank series, they know how to make highly innovative weapons, and the same applies here. These are only SOME of the weapons that blow your mind with their creativity: A sniper rifle that can slow down time, giving you time to get your shot ready, cannons that shoot needle-like bolts which bounce off surfaces, and my personal favorite. An assault rifle that shoots bolts of charges that have the ability to go through walls, killing your foes from the other side of the wall. As the bolts go through the walls, they also get stronger with each wall they pass. Resistance: A very strong part of the game is the enemy AI. As you battle through the game, you will encounter a huge variety of Chimera who vary from simple grunts, to long legged widow makers, and even a colossal beast that picks up men and throws them around. Some Chimeran soldiers are smart enough to take cover, change strategic positions, or team up with other Chimera in an effort to kill you. Granted the AI won't blow you away (the first half of enemies just stand there waiting to be shot after they ambush you) but it is good enough to give even vets of the genre a challenge. Wars Of Resistance: As great as everything is in Resistance, the best part of the game comes in the multiplayer mode. Simply put, it's incredible. We were consistently able to enjoy 30-40 player games with no noticeable lag whatsoever and all of these opponents made for outrageous all-out wars. The multiplayer options are flexible enough to allow users to scale maps down to accommodate smaller parties, choose either Chimeran or Human sides (complete with unique ability's for each race), and alter the rules to allow for a multitude of possibilities. But match customization and excellent 40-person play isn't the only thing that Resistance has going for it -- it also has strongly-designed maps, a countless number of trackable stats, a Call of Duty 4-like ranking system (a massive 60 ranks in total), clan creation with support for up to 200 members, and several different modes. Those modes include standard Deathmatch, Meltdown (Battle of the Node control), Breach (destroy your opponent's base), Capture the Flag, Team Deathmatch, and Conversion (all out last man standing war). Another great feature is the fact that buddies can even team up on the same console and play through the single-player game via split-screen, or go head to head with three other users for four-player versions of all of the online features. Rent vs. Buy: Despite all of these great features that don't disappoint, there are some points in the game that do. There are times in the game when you come across a tunnel or such with no enemies in it and nothing to do. These "slow" areas are meant to be breathers, and I understand this, but when you get one of these in the middle of the storyline right after a huge battle, you're going to feel a little let down. Other than that, this game is nearly perfect, with solid graphics, great weapon sound (not much musically though) and a tremendous multiplayer, this is a game that you have to pick up.